'Pataphysics, a term coined by the French writer Alfred Jarry, is a philosophy dedicated to studying what lies beyond the realm of metaphysics, in Jarry's words "the science of imaginary solutions". It is a parody of the theory and methods of modern science and is often expressed in nonsensical language. A practitioner of 'pataphysics is a 'pataphysician or a 'pataphysicist. 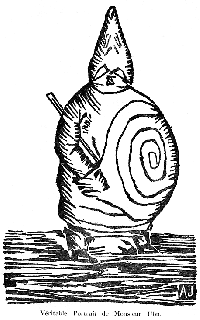 The term first appeared in print in Alfred Jarry's play text L'autoclète: guignol in the 28 April, 1893 issue of L'Écho de Paris littéraire illustré. Jarry later defined it as "the science of imaginary solutions, which symbolically attributes the properties of objects, described by their virtuality, to their lineaments" (Exploits and Opinions of Dr. Faustroll, pataphysician , II, viii). Raymond Queneau has described 'pataphysics as resting "on the truth of contradictions and exceptions." Jarry mandated the inclusion of the apostrophe in the orthography "to avoid a simple pun," the pun possibly being patte à physique (leg of physics), as interpreted by Jarry-scholars Keith Beaumont and Roger Shattuck, or possibly pas ta physique ('not your physics'), or maybe "Pâte à physique" ('physics-dough'). The Collège de 'pataphysique, founded on May 11, 1948, in Paris, is a group of artists and writers interested in the philosophy of 'pataphysics. The motto of the college is Eadem mutata resurgo ('I arise again the same though changed'), and its head is His Magnificence, Baron Jean Mollet. According to Warren Motte, noted members of the college have included Noël Arnaud (Regent of General 'Pataphysics and Clinic of Rhetoriconosis, as well as Major Confirmant of the Order of the Grand Gidouille), Luc Étienne also known as Luc Etienne Périn (Regent), Latis (Private General Secretary to the Baron Vice-Curator), François Le Lionnais (Regent), Jean Lescure (Regent of Anabathmology), and Raymond Queneau (Transcendent Satrap). As such, its members are linked with Oulipo. Publications of the college include the Cahiers du Collège de 'Pataphysique and the Dossiers du Collège de 'Pataphysique. The French authors Raymond Queneau, Jean Genet, Boris Vian and Jean Ferry have described themselves as following the 'pataphysical tradition. The philosopher Jean Baudrillard is often described as a 'pataphysician and did consider himself as such for some part of his life. One American writer, Pablo Lopez, has even developed an extension of the "science" called the pataphor. Although France had been always the center of the 'pataphysical globe, followers have grown up in different cities around the world. In 1966 Juan Esteban Fassio was commissioned to draw the map of the Collège de 'Pataphysique and its institutes abroad. In the 1950s, Buenos Aires and Milan were the first cities to have 'Pataphysical institutes. London, Edinburgh, Budapest, and Liege—as well as many other European cities — caught up in the sixties. In the 1970s, Germany, Sweden, Switzerland, Canada, The Netherlands, and many other countries showed that the internationalization of 'pataphysics was irreversible. In the 1960s 'pataphysics was used as a conceptual principle within various fine art forms, especially pop-art and popular culture. Perhaps the most famous mention of 'pataphysics remains The Beatles' 1969 song "Maxwell's Silver Hammer." (Source: Beatles Complete Guitar, Hal Leonard Corporation, 1986) Actual works within the 'pataphysical tradition tend to focus on the processes of their creation, and elements of chance or arbitrary choices are frequently key in those processes. Select pieces from Marcel Duchamp and John Cage characterize this. At around this time, Asger Jorn, a 'pataphysician and member of the Situationist International referred to 'pataphysics as a new religion. Rube Goldberg and Heath Robinson were artists who contrived machines of a 'pataphysical bent. During the Communist Era, a small group of 'pataphysicists in Czechoslovakia started a journal called PAKO, or Pataphysical Collegium. Apparently, Alfred Jarry's plays had had a short but lasting impression on the underground philosophical scene there. The Beatles' song "Maxwell's Silver Hammer" (from Abbey Road) discusses Joan, a student who "was quizzical / studied 'pataphysical science in the home." The Soft Machine songs Pataphysical Introduction Parts I and II from The Soft Machine Volume Two. Unless indicated otherwise, the text in this article is either based on Wikipedia article "'Pataphysics" or another language Wikipedia page thereof used under the terms of the GNU Free Documentation License; or on original research by Jahsonic and friends. See Art and Popular Culture's copyright notice. This page was last modified 19:22, 29 November 2018.